EDDYSTONE, Pa. (WPVI) -- Eagles fever is all over the Philadelphia region - including at church. 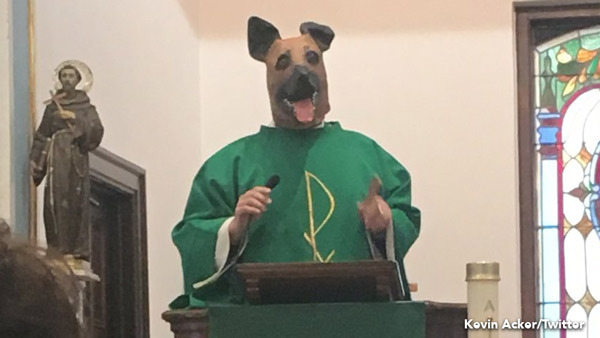 Deacon Anthony Dilenno decided to share his excitement for the Eagles' NFC Championship Game by wearing the now famous underdog mask. Kevin Acker was in attendance at St. Rose of Lima in Eddystone, Delaware County. He said everyone loved it. Lauren Hassinger, Deacon Dilenno's daughter, tweeted, "It's not everyday that you see this in church.... My dad Deacon Anthony DiIenno is the best! Go Birds." The dog masks became top sellers after Lane Johnson and Chris Long wore them following the team's win over the Atlanta Falcons. Underdog Eagles speak after big win. Jamie Apody reports during Action News at 11 p.m. on January 13, 2018. The masks became so popular they sold out on Amazon. The Eagles are allowing the masks at Lincoln Financial Field, but they have to be removed while fans go through security. In the same spirit, Johnson created a 'Home Dogs Gonna Eat' t-shirt that supports the School District of Philadelphia.